Our Goal: To raise sufficient funds for a new roof over the church in Kaupo. 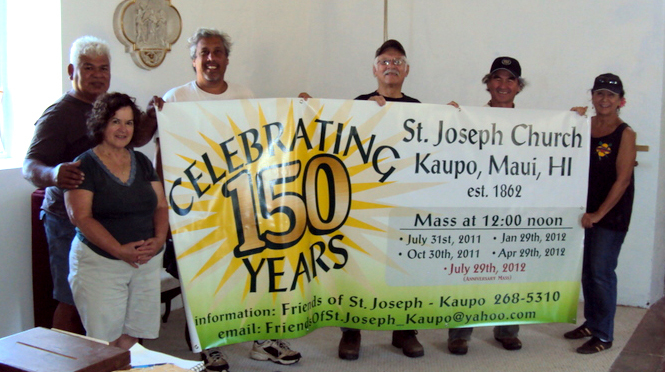 A steering committee has been formed, and the goal is to help restore St. Joseph Church at Kaupo. The Church building is in dire need of repairs: termite damage, roof needs to be replaced, walls may need structural bracing, etc. Presently we are awaiting the go-ahead for a structural assessment of the Church, which will then determine the next steps necessary toward achieving our goal. November 22, 2016: We mourn the passing today of Elizabeth (Beth) Daniels, one of the founding members of The Friends of St. Joseph-Kaupo. Beth’s loving, helpful ways will be sorely missed by all who love her. May our Lord and all the angels and saints embrace their newest, brightest angel among their midst. May the perpetual light shine upon her. Aloha No.